Feeling tired often - Your energy tends to be low and you may be weary and sleepy throughout the day. 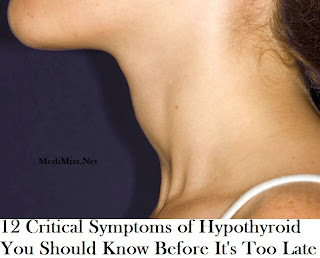 Weight gain - This symptom of hypothyroid may be the trickiest. If you try to lose weight and you're doing the right things such as exercising and eating the proper diet, and you still continue to gain weight, you can suspect hypothyroidism. Goiter - Swelling of the neck that happens when your thyroid gland in its present state tries to produce enough hormones but comes up short. The strain on your thyroid as it tries to compensate leads to this swelling. Swelling of the skin especially around the eyes and cheeks - This makes you look thick and puffy. Hoarseness of the voice - Your voice becomes raspy and throaty, all of a sudden. Unable to tolerate cold - You may be very uncomfortable in a cold environment and may feel cold even if your surroundings are warm. Slowed pulse - This symptom of hypothyroid relates to the over-all slowing of your body as mentioned, which makes your heart rate slow also. Difficulty in bowel movement - You may be constipated most of the time if you have hypothyroidism. Forgetfulness - You may become forgetful and the way you react to things may also be delayed. Menstrual irregularities - If you are a woman, symptoms of hypothyroid may include having a heavy period or bleeding in between periods. If you have any of the following symptoms of hypothyroid pointed out above, you should consult with a doctor immediately because it is important that treatment be started as early as possible if you have the disease.